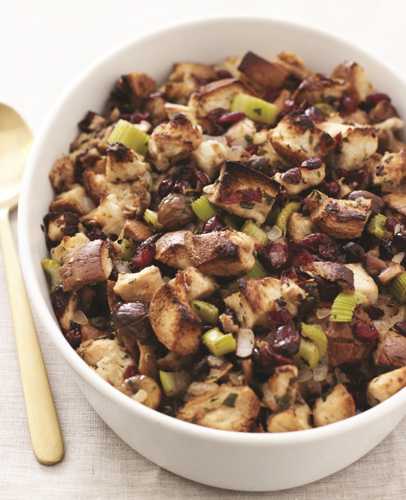 Your search for the best stuffing recipe of the year for Thanksgiving is over! Check out this amazing recipe!! You won’t be disappointed! I was trying to come up with an amazing stuffing recipe to share for Thanksgiving this year but all I could think of was this recipe by Jamie Geller in her book, The Joy of Kosher. I love every bit of this recipe! From the toasty chestnuts to the sweet and sour cranberries, every bite fulfills all my needs in a stuffing! Do not be intimidated by the name, this recipe is so simple and takes minutes to prepare! Jamie Geller, also known as the “Jewish Rachael Ray,” lives in Israel with her husband and five children. 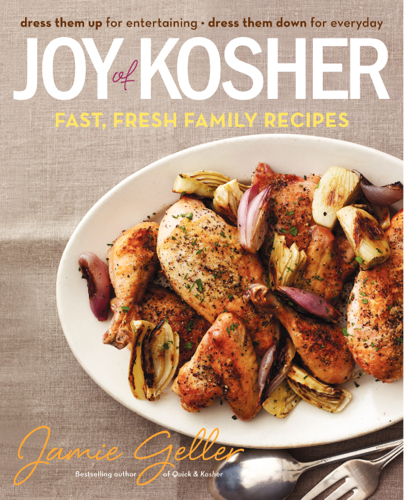 Her book, The Joy of Kosher, is filled with easy and delicious recipes and you don’t have to eat kosher to try them! As a Chef Wife, Jamie didn’t always know how to cook, she strived to learn, use the best ingredients, and create mouthwatering meals. Jamie is an inspiration to me because she went from knowing nothing about cooking to writing her own cook book and having her own network! 2. Heat the olive oil in a large Dutch oven or ovenproof saute pan over medium-high heat. 3. Saute the onions and celery until softened and the onion is translucent, 8 to 10 minutes. 4. Add the chestnuts, cranberries, sage, and parsley and cook 2 minutes more. 5. Stir in the challah, chicken broth, salt, and pepper. Remove from the heat. Cover and bake for 30 minutes. 6. Uncover and bake until lightly browned, 10 minutes more. You can find bags of roasted and peeled chestnuts in the snack aisle at the supermarket. This recipe doesn’t require day-old or stale bread, although it’s a great use for any leftovers on hand. Challah, hot dog and hamburger buns, even sandwich bread—use it all out, mix ’n’ match it, cube it, and make stuffing. Use vegetable broth in place of chicken broth. A robust red wine would overwhelm this dish, so go for the soft fruity flavors in Red by W to complement the red berry flavors of the stuffing. From the book JOY OF KOSHER: Fast, Fresh Family Recipes by Jamie Geller. Copyright (c) 2013 by Jamie Geller. William Morrow Cookbooks, an imprint of HarperCollins Publishers. Reprinted by permission.